Origin of Name: probably Norman. The Lindsays were of Lowland origin, the first known member of the family being Baldric de Lindesaya, a Norman who held lands in England and Normandy. Around 1120 Sir Walter Lindsay was a member of the Council of Prince David, Earl of Huntington, who became King of Scots in 1124; Walter's successor, William, acquired lands of Crawford in Clydesdale. Sir David Lindsay of Crawford acquired Glenesk in Angus by marriage with Maria Abernethy one of the heiresses of the Earldom of Angus and was hence created Earl of Crawford in 1398. The 4th Earl, the ferocious "Earl Beardie", was defeated by the Earl of Huntly in 1452 and deprived of his lands. His son, David was created Duke of Montrose by James III in 1488, this title ended on his death in 1495. The House of Lindsay established itself in Angus (although Lindsays were to be found throughout Scotland) and engaged in bitter feuds with the Ogilvies and Alexanders. The Lindsays remained loyal throughout to the Stewarts; the 6th Earl died at Flodden in 1513, the 10th supported Mary Queen of Scots and the 16th Earl commanded a regiment for Charles I. When he died the title passed on to a cadet branch, the Balcarres, already raised to earldom of Balcarres in 1651. In 1848, the House of Lords decided that the titles of Earls of Crawford and Earls of Lindsay belonged to James, 7th Earl of Bal carres who was then 24th Earl of Crawford. 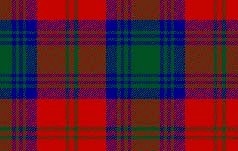 The Lindsays are celebrated for their literary talent, Sir David Lindsay of the Mount in Fife, created Lyon King of Arms, was a poet and reformer, and Robert Lindsay of Pitscottie was famed as a witty although unreliable historian. Our part of the family may have moved to Ireland and thus became part of the Scotch-Irish (as one family story goes). I think that this family came from Ohio to Missouri, but can't find any more information on Nathan (if that is his name). Daughter, Mary was born in Ohio in 1803, the year Ohio was admitted to the Union as a state. The 1800 Federal Census of Ohio was lost, all except Washington Co. There was a Margaret "Pegga" Lindsey (1782-1875) who married John Makemson II in 1805 in Logan Co, Oh. Also, Ann Lindsey (d 1813, sister of Margaret) m Andrew Makemson. Another sister, Eliza Jane Lindsey (2/20/1772-12/23/1858) married Thomas Makemson. They were settlers in Cynthiana, Harrison Co, KY. (south of Cincinnati). There is a town called Lindsey, Ohio in Sandusky County. (See map of townships) Sandusky County was formed in 1820 from old Indian territory. Stephen Lindsey b. ca 1775 Virginia, d. Sept. 7, 1864 Fulton County, Illinois, married Rachel Reynolds Dec. 1798 in Campbell County, Kentucky. The children of Stephen Lindsey & Rachel Reynolds were, Nathan (b. circa 1802 KY), James (died circa age 18), Jonah (b. Ohio), Jacob, Phoebe (m. Mr. Lovell), Reuben, Stephen, Hannah (m. Mr. Stoops) & Hezekiah. The migration path for Stephen Lindsey (1775 Virginia - 1864 Illinois) was his marriage and time in Campbell County, Kentucky to Clermont County, Ohio to Fulton County, Illinois. In an October 17, 1843 deposition by Stephen Lindsey (1775 VA - 1864 IL), he states, in 1782, he went to live, at age 7 or 8, with his maternal aunt, Ruth Beasley Dollar & her husband William Dollar, in Berkeley County, Virginia. Inferring the maiden name of Beasley, for the mother of Stephen Lindsey, provides a possibly connection to Edmond Lindsey (Long Marsh-now Clarke County, Virginia Lindseys), b. 1697 who married Elizabeth Beasley in Baltimore Co. MD in 1724. This could imply that Edmond Lindsey & Elizabeth Beasley were the grandparents or great-uncle/aunt of Stephen Lindsey. Another Lindsey website with a list of Lindsey/Lindsay researchers. • William J. Lindsey and his wife, Jane Taylor of Ohio. Both Wm. and Jane were born in Ireland. • Thompson Lindsey from Brown or Clermont Co, OH, married Mary ? and had a son, Thomas Jefferson b. 1839 m. 1859 to Margaret Jane Sidwell and d. 1863 at Cathage Tn. • Samuel Lindsey, b Pa; m Margaret who was b Pa; moved to Ohio; then on 1850 census of Perry Co, IL. • George Lindsey, b 1790, brother of Charles who went to Ohio from VA. In 1821 daughter Mary"Polly" Lindsey was listed on her marriage record (to Martin Willard) as being a resident of Tywappity township, on what was then the northern border of Cape Girardeau Co. , Mo. The census of 1830 there shows Nathan Lindsey on page 449 (next door to Martin Willard) who is 50-60 years old. He is the only Lindsey who was old enough to be the father of Polly and the other younger Lindseys. Mary named one of her sons Nathan; of course she also named one of them William Henry (which could be the typical one son who is named for both grandfathers). 1d) Nathan Willard, b 1838; m Elizabeth ? 2. WILLIAM LINDSEY, b 1805, Ohio; July 26, 1826 he signed a petition in Adams Co., Ill. along with Solomon Greer, Martin & Henry Willard; m Jan 22, 1829, Cape Girardeau Co, Mo to Christiana Greer, by George Henderson, J.P. (Book A-42). In 1830 he was in Cape Girardeau County, Mo. This family made its way from Missouri to Illinois to Iowa. Solomon is in the 1840 Federal Census of Jo Daviess Co. (p391) as "Grear, Solomon 100 01 - 210 01 1"
In 1850 & 1870 they are still in Jo Daviess Co, but there are no Greers there in 1880. 5. LEMUEL LINDSEY, b abt 1810, 1830 in Cape Girardeau county near rest of Lindsey & Willard families. 3.William Lindsey & Christiana Greer. 1. 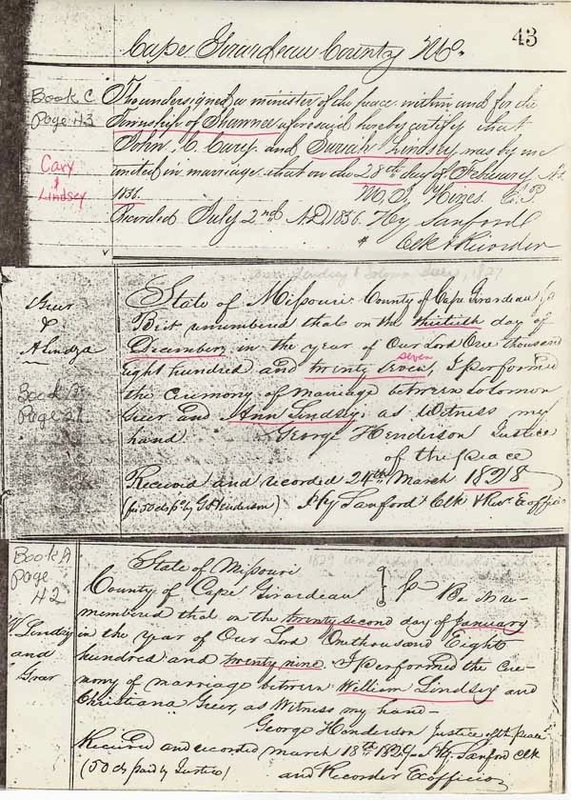 Nancy Lindsay, married Samuel Hannah in Cape Girardeau Co, Mo., May 12, 1850. 2. Caleb Lindsey, married Pauline C. Robit (residents of Jackson, Ill.), Cape Girardeau Co, Mo., Jan. 22, 1860. 3. Amanda J. Lindsey, married James T. Hamilton, Cape Girardeau Co, Mo., Sept. 27, 1866. 4. Isaac M. Lindsey, married Elizabeth York, Cape Girardeau Co, Mo., Dec. 18, 1866. 6. John L. Lindsey married Harriet W. Allifield (both of Alexandria Co., Ill.) in Cape Girardeau Co., Mo., June 16, 1867.